We offer the Sleeve Gastrectomy, Roux-en-Y Gastric Bypass and Duodenal Switch, as well as revisional surgery if you are dealing with issues related to a prior bariatric surgery. If you are looking for a surgeon to help you with a previously placed gastric adjustable band we may also be of service. There are many types of bariatric surgeries. We encourage you to investigate all the different types of surgeries available. The decision on which procedure will best fits your needs is ultimately best made with the help of a bariatric surgeon. Sleeve Gastrectomy – involves surgically removing the left side of the stomach, leaving a much smaller stomach about the size and shape of a banana, maintaining the basic function of the original stomach. The pyloric valve is preserved. This valve is at the last portion of the stomach and allows food to pass through to the small bowel when it is at the right chemical and mechanical consistency. 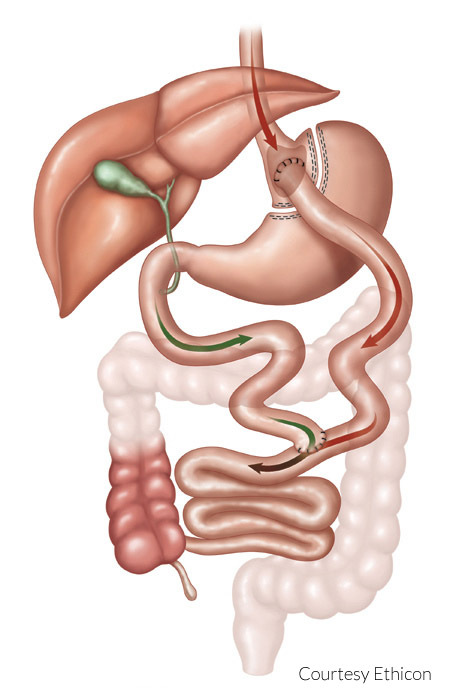 Duodenal Switch (Gastric Reduction Duodenal Switch) – The stomach is decreased in size by performing the Sleeve Gastrectomy. The small bowel is then reattached in a fashion to keep the digestive juices away from the food until it reaches the last portion of the small bowel, limiting absorption of the nutrients in the food eaten. A key point of the Duodenal Switch is the preservation of the pyloric valve. This valve is at the last portion of the stomach and allows food to pass through to the small bowel when it is at the right chemical and mechanical consistency. Currently, there is also a loop version of this procedure being performed, that so far has shown to create less risk of malnutrition and vitamin deficiency problems. Continue scrolling down to see detailed descriptions of each surgery, which include specific advantages and disadvantages. We also recommend that you check your BMI with the calculator below. Most insurance companies require patients to be a body mass index (BMI) of 40 kg/m2 or greater, or a BMI of 35 kg/m2 or above with weight-related medical problems before they will consider authorizing bariatric surgery for you. This procedure involves removal of approximately 80 – 85% of your stomach's volume; the remaining stomach is secured closed with staples and suture. This creates a long vertical tube or banana-shaped stomach. The sleeve gastrectomy does not involve cutting or changing the sphincter muscles that allow food to enter or leave the stomach. When you eat after having this surgery, the smaller stomach will fill up quickly. You will feel full after eating just a very small amount of food. It is important that you follow the diet instructions provided by your surgeon. There are two parts to this procedure. The creation of a small stomach pouch and then the creation of the Roux-en-Y intestinal bypass. The procedure is done mainly laparoscopically, and rarely through an open incision. 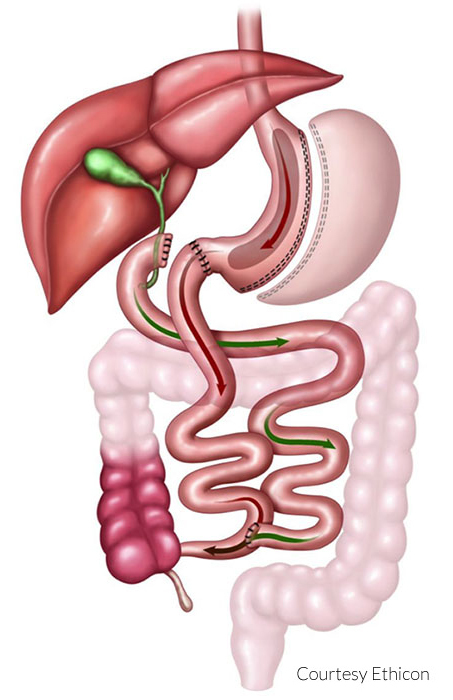 After the surgery, food passes from the stomach pouch into the jejunum, bypassing the duodenum. This reduces some absorption of calories and nutrients, though currently research has shown that bariatric surgery works mainly from altering the balance of gut hormones, which decreases the sensation of hunger as well as the set weight that the body tries to maintain. The small bowel that is connected to the small stomach pouch is not as resistant to stomach acid; anything at increases acidity (smoking, NSAID medication use, alcohol use) may cause ulcers at the connection. This is called marginal ulceration. This procedure also has two parts and is sometimes done in stages. One of the benefits of Duodenal Switch is the preserving of the pyloric value. This procedure is done both Laparoscopic and Open. The stomach or restrictive portion of this procedure is the Sleeve Gastrectomy. 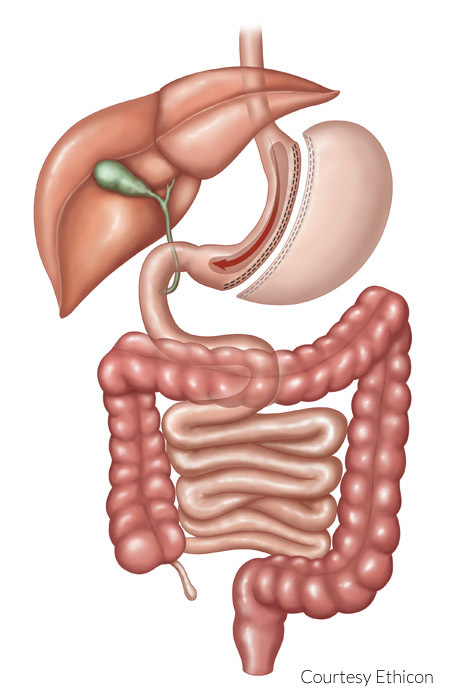 The small bowel is divided into two parallel limbs, one limb is attached to the stomach and the other is attached to at the Duodenum (small intestine) this will keep the biliopancreatic juices away from the food you eat, until the last portion of the small intestine were the limbs are reconnected. This is commonly referred to as the common channel. Blood clots can develop in the legs (deep venous thrombosis – DVT), and can potentially break off and travel back to the lungs (pulmonary embolism), which can be life-threatening. This is historically the most common cause of death from a bariatric procedure. Several precautions are taken to prevent the formation of blood clots; as a patient, the best thing you can do to prevent blood clots after surgery is to walk frequently and not remain sitting down for several hours at a time, at least for the first month. Any time a new connection or staple line is made in the bowel, there is always a possibility of it breaking down or failing. This is rare, but if it occurs it can potentially be life-threatening and further surgery or other procedures may be required. As new bowel connections heal they may potentially narrow as they scar down. Sometimes they scar down to a point where food has a harder time passing through than desired. This can usually be fixed with endoscopy (a camera placed down the throat and into the inside of the bowels) but sometimes requires surgery to fix. Dehydration is by far the most common problem after a bariatric surgery. The amount of fluids one can drink at a time becomes limited, so if one falls behind on drinking fluids and becomes dehydrated it can be very difficult to catch up. This is compounded by the fact that dehydration itself can cause nausea and vomiting. After bariatric surgery, medications to treat diabetes may not be required anymore. The time period in which this occurs can vary between patients, and often may happen immediately after surgery. It is important for a diabetic patient to continue checking their blood sugars for 2-4 weeks after surgery, maybe longer depending on whether they are continuing to need medication or not. The rearrangement in anatomy can affect the way some medications are absorbed in the body, and dosages may have to be adjusted. Close follow up with your primary doctor is important so your medications can be adjusted accordingly as your medical conditions improve with the loss of weight. All bariatric surgery will patients at increased risk for vitamin deficiency in the future. In general, this risk is small with the sleeve gastrectomy, moderate with the gastric bypass, then greatest with the duodenal switch. Regardless of the surgery, the requirement of taking vitamins is long-term. The appropriate vitamin regimen will be specified by the bariatric surgeon and the hospital/program in which the surgery is performed. Most patients undergoing bariatric surgery notice changes in their bowel habits, especially immediately after surgery. This is in combination due to the drastic change in food intake as well as the alteration of the GI tract anatomy. Individual patient experiences vary, though duodenal switch patients almost always suffer from diarrhea the first 4-6 months. Normally bowel habits normalize after 3-6 months. Duodenal switch patients in particular may deal with diarrhea long term, especially when eating fat/cholesterol-rich foods. Particular tastes and food preferences may change greatly, particularly immediately after surgery. Foods that were once favorites may seem distasteful, and even vice versa. This intolerance for certain foods may be particularly strong in the short term, even to the point of causing nausea; this tends to resolve itself over 3-6 months. After a gastric bypass the body is sensitized to increases in blood sugar concentrations; after a carbohydrate-rich meal, the body may overreact in its attempts to lower the now increase levels of sugar in the blood, to the point where about half an hour to an hour later the blood sugars are abnormally low. Symptoms of low blood sugars include dizziness, nausea, abdominal cramping, tremors, and occasionally even passing out. Prevention involves not eating a large amount of carbohydrates in one sitting, as well as eating protein with meals. If symptoms are significant then there are also medications that can help normalize blood sugars. In rare severe cases reversal of the gastric bypass or revision to different anatomy has been performed. With any intestinal rearrangement, there is a risk of diarrhea after eating meals; this is not necessarily due to food running through the bowels too quickly, but a reaction of the lower gut to the upper gut seeing nutrients more quickly than normal. This particularly occurs again with carbohydrate intake. This is also again combatted by eating protein with meals or reducing the amount of carbohydrates eaten in one sitting. The rapid weight loss that occurs during the first few months after surgery puts patients at increased risk of gallstone formation. Gallstones do not always cause problems but when they do, symptoms usually continue to recur until the gallbladder is removed (cholecystectomy). If symptoms of gallbladder problems are present before surgery (cramping abdominal pain and nausea with meals) an abdominal ultrasound can be performed to evaluate the gallbladder for stones. If present the gallbladder may be removed at the time of the bariatric surgery. After surgery, a medication can be taken to help prevent gallstones. If abdominal pain or nausea after eating is present that cannot be attributed to problems from the bariatric surgery, the possibility of problems from gallstones should be considered. With any intestinal rearrangement, new spaces are created within the abdominal cavity that other loops of bowel can potentially get caught in, causing an obstruction in the bowel. This is called internal hernia. These places are usually closed at the time of surgery, but with surgical healing and weight loss, those spaces may potentially open up over time. Symptoms of an internal hernia are abdominal pain, constipation, and nausea, but potentially without any vomiting depending on how the bowel is obstructed. This can occur anywhere from weeks to years after surgery and can constitute a surgical emergency. The bottom line is if any symptoms of severe abdominal pain and nausea occur after surgery, it is important to contact a bariatric surgeon, preferably the surgeon that performed the surgery to begin with. With any abdominal surgery, there is a risk of developing a hernia at the site of the incisions. With the advent of laparoscopic surgery and the use of small incisions, this risk is now minimal, but can still happen. For persistent pain or increasing redness at an incision site the operating surgeon should be contacted, especially if the pain is accompanied by nausea/vomiting. Stomach ulcers can be a problem even without surgery. NSAID medications (e.g. ibuprofen/Motrin/Advil, aspirin, Aleve/naproxen), smoking/tobacco, and alcohol use can increase the risk of developing stomach or intestinal ulcers. That risk of ulcers is greatly increased after a gastric bypass, likely due to the fact that the new stomach/intestine connection has less of a blood supply, as well as the fact that intestinal lining is not designed to withstand acid exposure like the stomach lining. Problems associated with ulceration include bleeding, pain, blockage of the connection (due to swelling and scarring), and the worst-case scenario of perforation, which can make someone very sick and is a surgical emergency. If NSAID medications are required for medical problems like arthritis or are likely to smoke or drink heavily then surgeries other than the gastric bypass should be considered – though anyone smoking should not have surgery to begin with, due to significantly increased risks of short-term complications. Particularly researched in the setting of gastric bypass, it has been noted that patients undergoing bariatric surgery are at increased risk of alcoholism, as well as any other addictive behavior, particularly in the first year after surgery. Additionally, most people after bariatric surgery will notice they are much more sensitive to the effects of alcohol. We recommend that anyone undergoing bariatric surgery avoid alcohol at least for the first six months, if not ideally for a year. It is important to identify coping mechanisms before surgery to be better prepared to handle stress after surgery. Eating food will no longer be a way to cope with problems. This is also why a consult with a psychologist is mandatory before anyone gets bariatric surgery, to determine if someone is ready for the changes in life that occur afterward. Patients with already-diagnosed psychiatric conditions can still have bariatric surgery, but it is important they are well-treated and stable. Many women who suffer from obesity have abnormal menstrual cycles and may be dealing with infertility as well. This is due to the fact that fat cells in the body produce estrogen. When there is excess body fat, there is an abnormal increase in estrogen that is constantly being generated; this disrupts the cyclic changes in estrogen levels that are normally controlled by the ovaries. Conversely, as obese women lose weight after surgery they may also notice their menstrual cycles becoming more regular; additionally one’s odds of getting pregnant increase as well. It is in general not a good idea to become pregnant during the first year after bariatric surgery, as losing significant weight while nurturing a growing a baby in the womb is not an ideal situation. Though there have been no reported significant adverse outcomes in this situation, studies have shown that babies born during that time period tend to be underweight. Therefore it is recommended that women use two forms of birth control during the 1st 6-12 months after surgery, to avoid pregnancy. With all bariatric surgeries, there is always the possibility of regaining the lost weight, no matter what surgery was performed. This normally occurs 2 or more years out from surgery, and tends to involve going back to bad eating habits (particularly carbohydrate intake). It is important to realize that improvements in eating and exercise habits are meant to be life-long. Bariatric surgery is not an easy fix, but more of a helping hand out of the difficult situation of being obese and having weight-related problems.